Who will hold Ronda down at WrestleMania? The WWE Universe was expecting a great episode of Raw this week after a lot of build-ups last week, and that's exactly what they got. Apart from average and below-average matches between Kurt Angle and Chad Gable, and Ricochet and Jinder Mahal, the night was packed with some great action and segments. Kurt Angle finally announced who he’s like to face at WrestleMania 35 in his last ever match in the squared circle. The Women’s Tag Team Championships found new challenges, while old challengers were not resting easy. And the Universal Champion, the challenger, and The Chosen One, all made their points in one night to make the show a huge hit. While all that was made possible, there were still a few shocking moments from the show which surprised us all and made us reevaluate the storylines in progress. Let’s take a look at 5 shocking moments from the show, and share your favorites in the comments below! 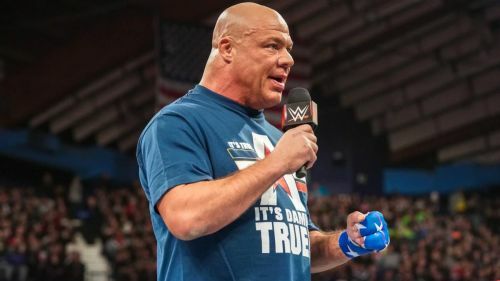 Kurt Angle made out to the ring early in the show to announce who he would like to face at WrestleMania 35 in his final match. The Olympic Gold Medalist made clear he was allowed by the McMahons to choose anyone for his final match at The Showcase of the Immortals. After having said that, Angle still picked Baron Corbin to face as his last opponent. He claimed that he’d picked Corbin because of how difficult Corbin had made his life in the past year. This was a shocking pick, as there were many other superstars who could have been better picks for Kurt Angle to choose from. Names like John Cena, Shelton Benjamin, and even Finn Balor were floating through the internet, but Angle chose Corbin. The reason could be Corbin’s value on the main roster, where he is basically a filler character and has failed to win matches in the past year since his character change. If Angle is going to win his final match, it makes sense that Corbin will be taking the final pin from the legendary superstar.